Friday, May 17, 2002... Greetings from Janesville, Wisconsin. If that sounds familiar, I stayed here last Saturday, too...and it's just far enough from Milwaukee to dull the urge to do violence to Bud Selig which comes on every time he opens his mouth, or whatever organ produces his public utterances. But that issue's for the other side of the Web site. Here, the important subjects are tourist traps and large concrete animals...and today's main stop, the National Fresh Water Fishing Hall of Fame and Museum, combined the two. Like its baseball counterpart, the Fishing Hall of Fame and Museum contains plaques of the inductees and thousands of artifacts from the sport. 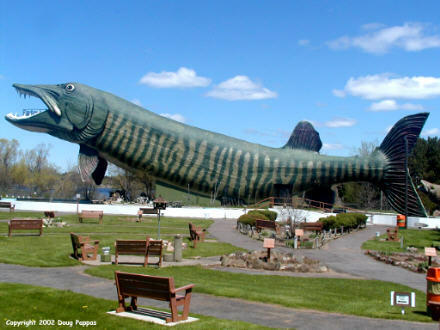 Unlike its baseball counterpart, the Fishing HOF also displays a lawnful of oversized concrete fish and the walk-through World's Largest Muskie depicted here. The two Halls of Fame have one member in common: Ted Williams was elected to the Fishing Hall of Fame in 1995. Unlike the College Football Hall of Fame, the Fishing HOF has not inducted a half-dozen Presidents, though several Congressmen adorn its roster. In addition to the fishemnen, the HOF also honors Legendary Fishing Guides and those who have popularized the sport through the media. (There's a professional bass fishing tour with weekly tournaments on cable.) The Museum includes mounted specimens of The Big Ones That Didn't Get Away, photos of proud recordholders with their catches, plus rooms full of rods, reels, outboard motors and fishing lures. Masochists should consider collecting the latter: a drawerful of collectible lures contains hundreds of sharp spikes protruding at all angles. In fact, one wall of the museum displays a collection of fish hooks and related pieces of sharp metal extracted from fishermen by a local doctor. A small gift shop near the entrance sells maps, identification charts and fishing-themed T-shirts ("I Have a Crappie Attitude"). The Fresh Water Fishing HOF and Museum is located in the resort town of Hayward, Wisconsin, an area so isolated that even with all of my past travels, I'd never come within an hour's drive of the place. For much of the drive up from the Twin Cities I felt conspicuous to be driving a passenger car rather than a pickup or SUV; as I got closer, about a quarter of the other vehicles were towing something large. I also noted that with metropolitan Minneapolis-St. Paul extending to within a dozen miles of the Wisconsin line. western Wisconsin was Twins country. Gee, what a surprise: still more evidence of yet another Bud Selig lie. Last December Selig had claimed that his Milwaukee Brewers wouldn't benefit from the contraction of the Twins, asserting that St. Louis and Milwaukee were about the same distance from Minneapolis. Oh yes, back to the trip. From the Fishing Hall of Fame, I drove to the small town of Neillsville for a Roadside Trifecta: a single lot contained the World's Largest Talking Cow (Chatty Belle, who would have touted the virtues of Wisconsin dairy products if her speaker had been working), the World's Largest Replica Cheese (a non-organic copy of the mighty Cheddar manufactured for the 1964 New York World's Fair), and the reconstructed Wisconsin Pavilion from the '64 World's Fair, which now sells cheese and cellphone service as well as housing a local radio station. Then it was time to swing through Wisconsin Dells, the Upper Midwest's answer to Myrtle Beach, Gatlinburg or the New Jersey shore. Starting from a scenic riverside, the Dells have grown to include miles of waterslides, miniature golf courses, theme restaurants (think low-budget Medieval Times), and the Wisconsin Ducks, land/water tours via World War II-vintage amphibious vehicles. There's even a little touch of Branson creeping in -- a dinner theater marquee proclaimed that Anne Murray and Don Ho, among others, would be appearing there over the summer. I resisted the temptation to stop and make reservations. It's safe to say that the Dells are the only major resort area whose attractions include a dozen cheese stores. The Wisconsin "cheesehead" image is no joke -- there really are cheese-and-sausage stores all over the place, as common as seashell shops in Florida or plastic surgeons in southern California.